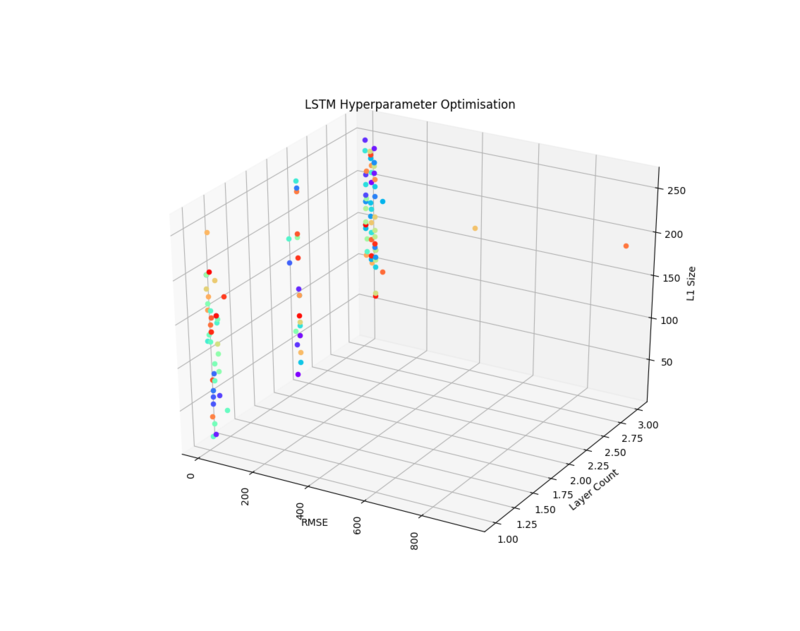 In this post I will descibe how to use a combination of tools to speed up hyperparameter optimisation tasks. Instructions are provided here for Ubuntu, but could reasonably be applied to any *nix system. It may not be immediately obvious for any given problem what network configuration is best for a given task, so we can use hyperparameter optimisation decide for us by intelligently iterating through a search space of the parameters you want to optimise. Hyperopt uses Tree-Structure Parzen estimators and is quite good at rapidly deciding on an optimal set of parameters. It works by running and evaluating a model, returning a loss score and then running another model with slightly different parameters that aim to minimise the error score. The hard part for you, is devising a search space for your problem, which may be quite large. To save time, we can run these models simultaneously across any number of machines, and even have each machine run multiple models (provided it has enough cores). Luckily there are python libraries that do all this hard work for us! You will now have a self contained python install in $HOME/.pyenv/versions/3.6.5. Keep in mind that it needs to build a python install and so might take a while. You can copy the ~/.pyenv folder to any machine you want to run on. Just remember to copy your ~/.bash_profile (or equivalent) to each machine you want as a worker. Note the name of the experiment key: mnist_test, this will be the key in the jobs collection of the jobs database in mongodb. After every model has completed, it will be stored in mongodb. It may be possible to store the weights in the output document (the output of model.get_weights(), but mongodb has a limit of 4MB per document. To get around this, GridFS is used to transprently store blobs in the database of the model itself. I’ve also stored the duration in the result object as well, since you may find 2 models with very similar loss, but the one with slightly better loss may have significantly higher runtime. You should get an output file called temp_model.py (if you don’t, make sure you have updated to the latest hyperas code from github). Make sure this file is visible to your workers. These are all your other machines (may also be on the controller machine). Make sure you have pyenv installed on them too, it can be easy to just zip up the .pyenv folder and copy it your home directory on your worker machines and unzip it. This way you don’t miss any dependencies. Now you can run ~/hyperopt_job/job.sh on your worker machines! Keep in mind that they need to be able to access the mongodb. The workers will continue running jobs until you have reached max_evals as defined at the end of optimise_task.py. If your home drive on the worker machines has limited space, consider unzipping to a tmp directory and setting the PYENV_ROOT environment variable accordingly. We can do better by using pssh to do the above automatically for a list of given hosts. pssh -h hosts.txt  bash -c "nohup  ~/hyperopt_job/job.sh &"
This will start a start job.sh on each host listed in hosts.txt. nohup will prevent the process from stopping when the ssh session disconnects.